Add all of your favorite fresh vegetables to this simple pasta dish and garnish with shaved Parmesan cheese if desired. Cook pasta al dente according to package instructions. Drain and keep warm, reserving 1/2 cup of pasta water. Meanwhile, melt butter in a large skillet over medium high heat. Cook garlic and onion for 1 to 2 minutes. Add pepper and asparagus, and cook for 2 to 3 minutes, stirring occasionally. Stir in reserved pasta water and bring to a boil. Reduce heat to medium and simmer for 4 to 5 minutes. Stir in Pasta Sauce and tomatoes, and simmer for an additional 6 to 8 minutes, or until heated through, stirring occasionally. Season with salt and pepper to taste if desired. Serve hot with cooked pasta. For a spicy variation, add 1/4 tsp. of crushed red pepper flakes. 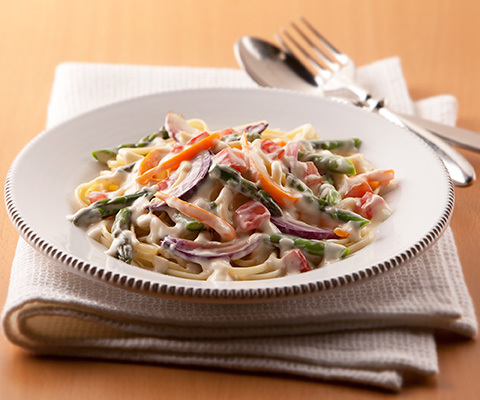 TIP: If desired, substitute Classico Light Creamy Alfredo Pasta Sauce with Classico Mushroom Alfredo Pasta Sauce. This a perfect easy night meal for the family. I add a little extra garlic and mushrooms. Creamy sauce, flavors fused throughout the entire dish and pairs great with garlic toast.